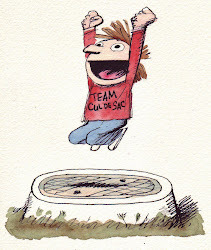 I have the official news that we will have aTeam Cul de Sac Panel at Comic-Con, Saturday, 7/20/13 Times will be announced closer to the date. Team Cul de Sac Join Chris Sparks, editor and organizer of the Eisner Award Nominated Team Cul de Sac: Cartoonists Draw the Line at Parkinson's book. Joining him are several contributors who will talk about the creation of this amazing original cartoon art book that was done in tribute to Richard Thompson, Reuben Award winner and the creator of the comic strip "Cul de Sac." The book features art from dozens of cartoonists in print and web, including the first original art published in 16 years by Bill Watterson of "Calvin and Hobbes" fame, and has helped raise over $105,000 towards Parkinsons research through the Michael J Fox Foundation. Panelists scheduled to appear: Lincoln Peirce (Big Nate), Mark Tatulli (Lio), Lucas Turnbloom (Imagine This), Andrew Farago, (Curator, Cartoon Art Museum), Shaenon Garrity (Skin Horse, Narbonic), Jenni Holm, (Baby Mouse) an Eisner Award nominee. Session moderated by Tom Racine (Tall Tale Radio podcast).